When it comes to donuts, for some reason my favorite are always those tiny cute donut holes. 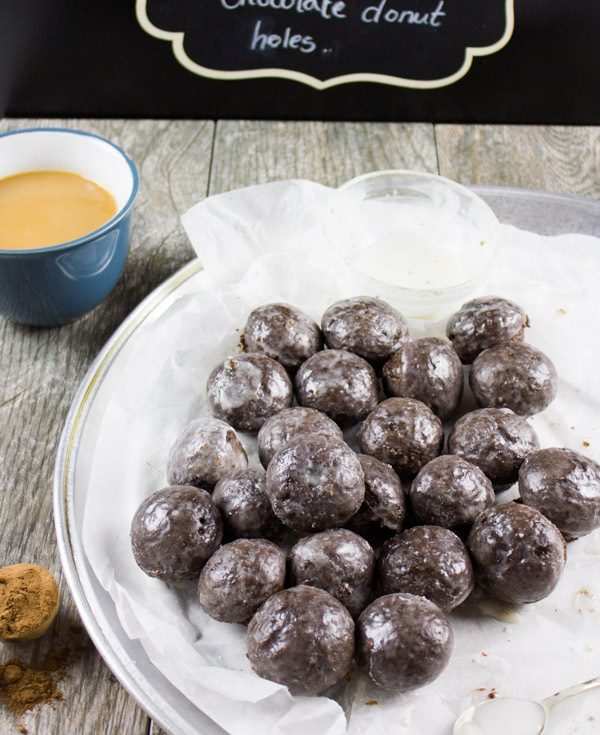 And these chocolate donut holes are one of my favorites. 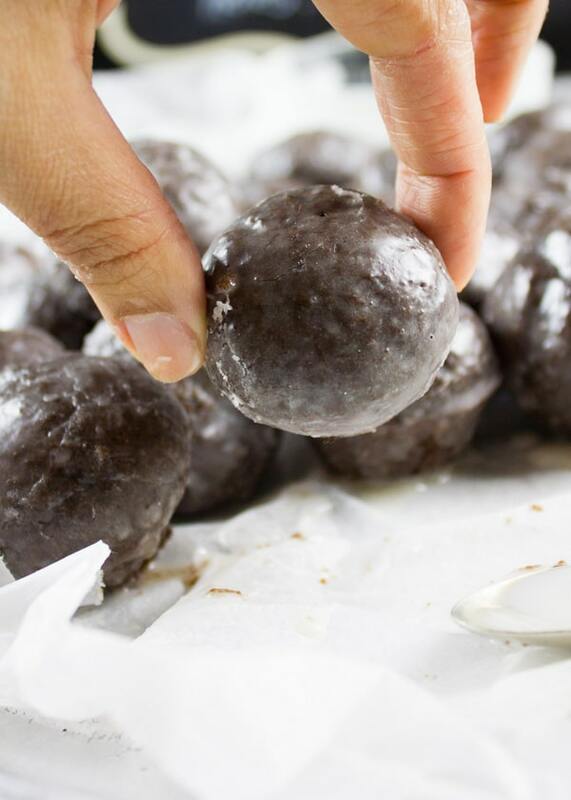 Not only because they’re donut holes, they also happen to be super chocolate-y, tender and stay moist for days. Plus they’re baked, not fried so that’s an absolute bonus for me. And last but not least, they have a spike of caramel flavor that takes your average chocolate donut hole to a level of divineness like no other! YES! It’s chocolate time! It’s actually caramel chocolate time, so even better 🙂 Did you all have a fantabulous Easter break? I keep telling myself before every food occasion—portion control, portion control portion control. But guess what, it seems like it never ever ever happens. So we were invited for Easter dinner this year, and I had promised myself to keep it under control since we had plenty of treats last week ( hint: chocolate donut holes ). But as it turns out, I failed miserably. 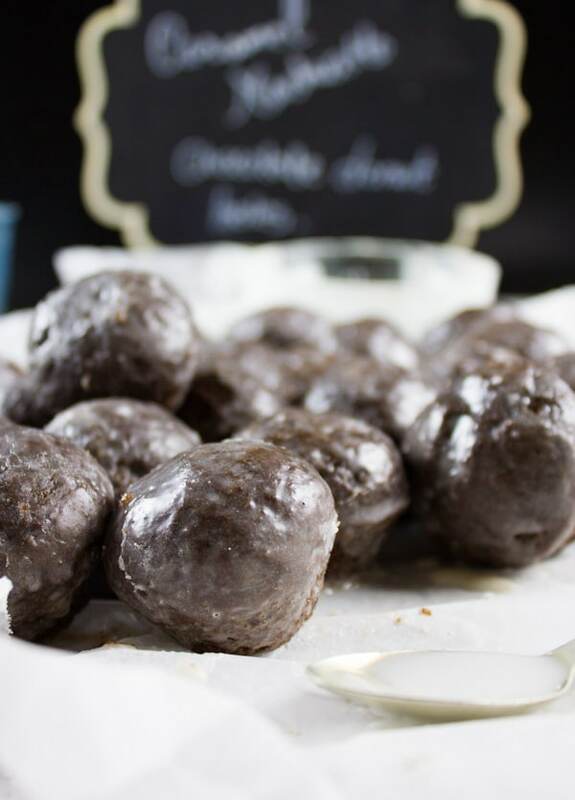 Good news is, I don’t feel a bit guilty about those baked chocolate donut holes—they were light as air! If you’e curious about that caramel spike, let me tell you I have a secret ingredient! 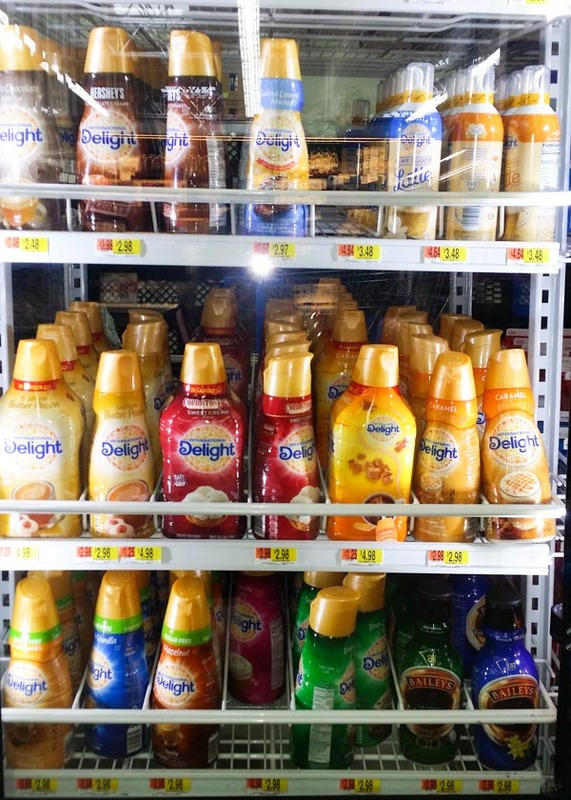 I headed off to Walmart to buy some International Delight® Creamers for my coffee. I’ve actually tried the new one touch latte (again caramel macchiato flavor too!) and loved it. So I picked up the International Delight® Cold Stone Creamery™ Sweet Cream and International Delight® Caramel Macchiato. I know there are plenty of other amazing flavors, but I chose those to pair with my coffee. 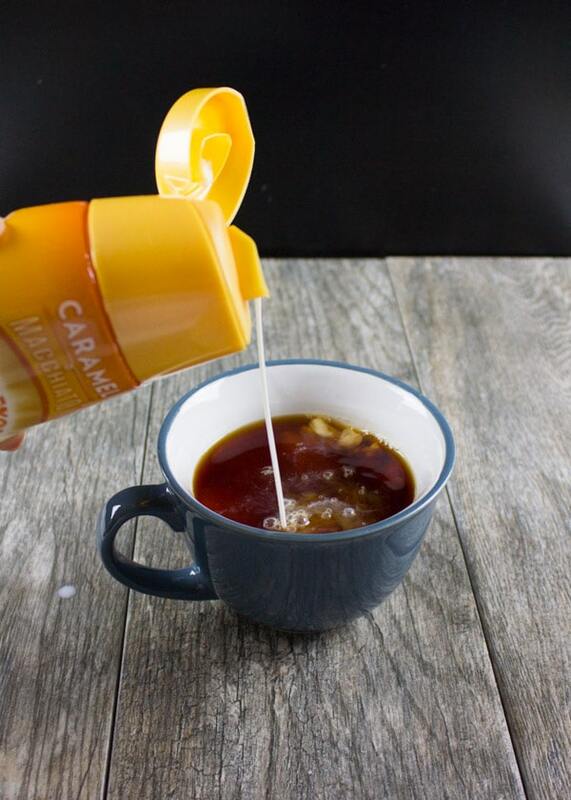 The International Delight® Caramel Macchiato has a mellow creamy richness swirled with the taste of bold, luscious caramel. While the International Delight® Cold Stone Creamery™ Sweet Cream has a rich, sweet indulgence that brings to mind the taste of fresh, homemade ice cream. For the record, any of your favorite flavors would work beautifully here! Now let me tell you just how perfect those chocolate donut holes are. To start off, they’re pure chocolate lush. Made with cocoa powder only, so they’re super rich in chocolate flavor. 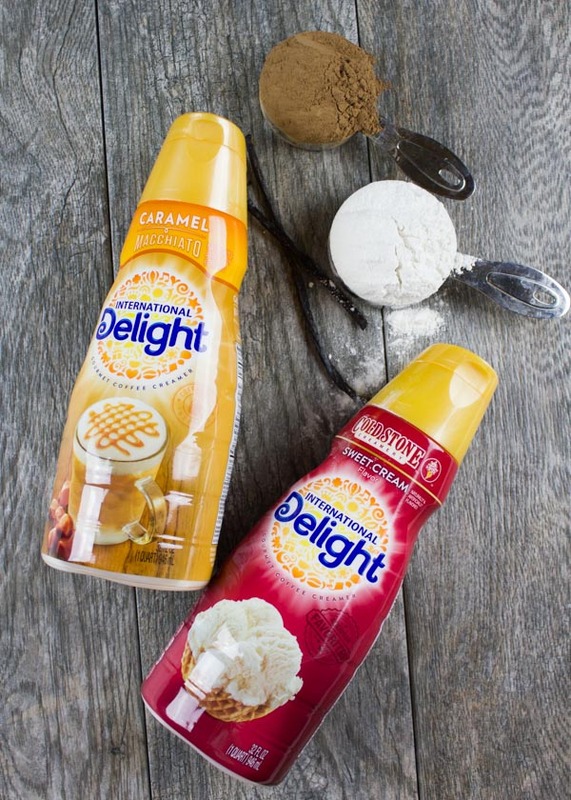 Furthermore, I added the International Delight® Caramel Macchiato to my batter and it did a few amazing things. First of all flavor. Flavor flavor flavor! Then comes the sweetness. It actually replaced a good portion of sugar from my original recipe. 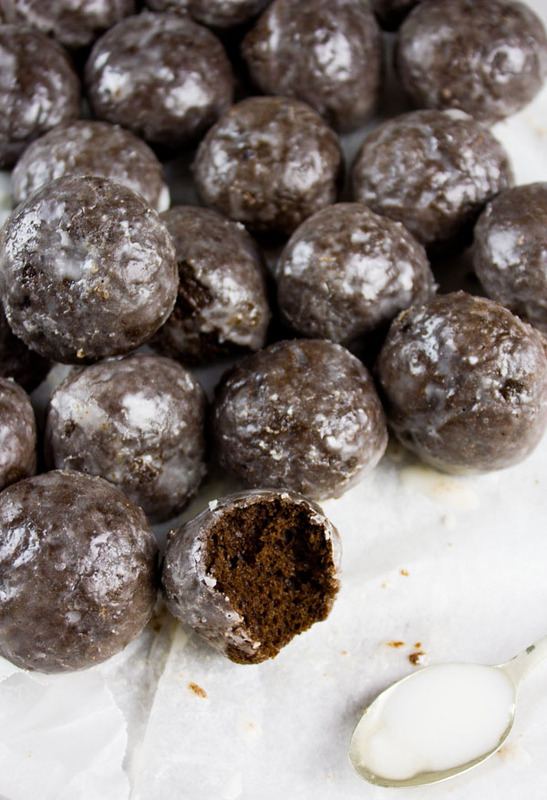 In addition to that, it added moisture—so as a result there was a nice tender texture to the chocolate donut holes which kept them fresh for four days. Obviously they won’t last you that long lol I had to keep one in a small glass container and checked on it everyday. By day five I would say it started to feel a bit stale. 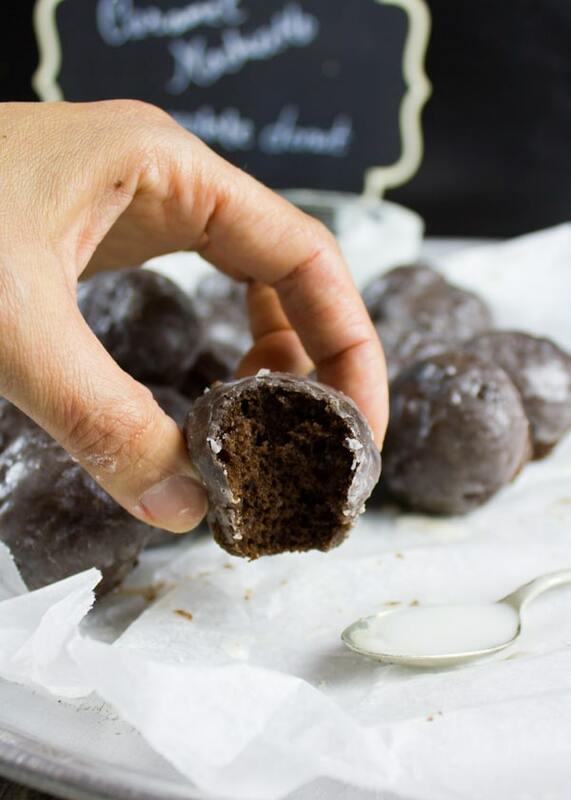 So these chocolate donuts are great if you make them in advance too. 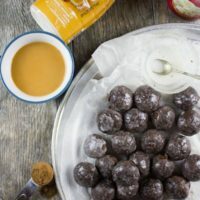 Ok so let me show you quickly how to make those out of this world chocolate donut holes so you can sit back, make a cup of coffee, close your eyes and enjoy every bite of donut with a sip of coffee! 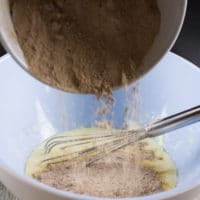 Have your dry ingredients in a bowl (flour, baking powder, baking soda, cocoa powder). 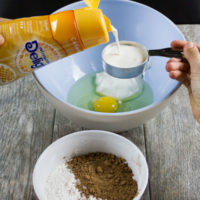 Have your wet ingredients in another bigger bowl (egg, yogurt, oil, sugar) and add to them the International Delight® Caramel Macchiato.Now just add the flour mixture to the wet ingredients bowl and mix them well. 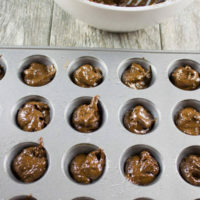 Spoon the batter in a mini muffin pan (well greased or lined with a cupcake liner if you prefer). 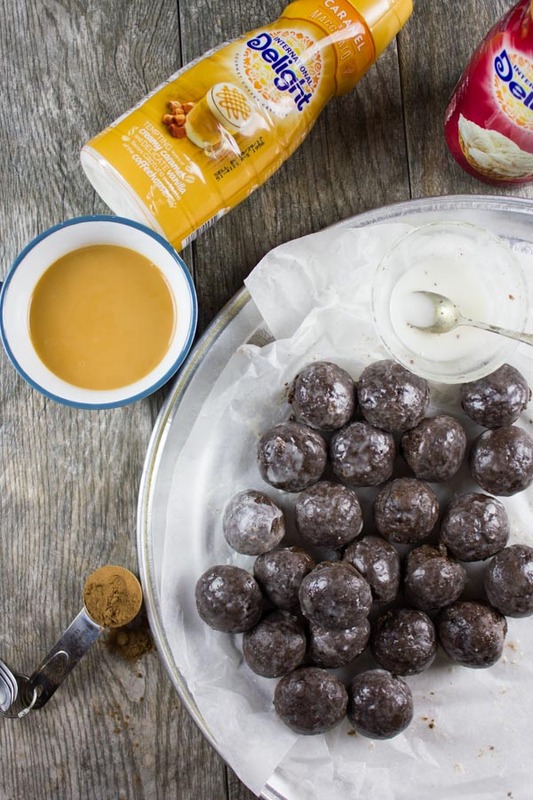 Bake the chocolate donut holes for 10-12 minutes until puffed and stingy to the touch. Just look how soft and fluffy it is on the inside! And that glaze when it hardens, it forms a nice delicate sugary crust—perfect contrast with the tender donut. 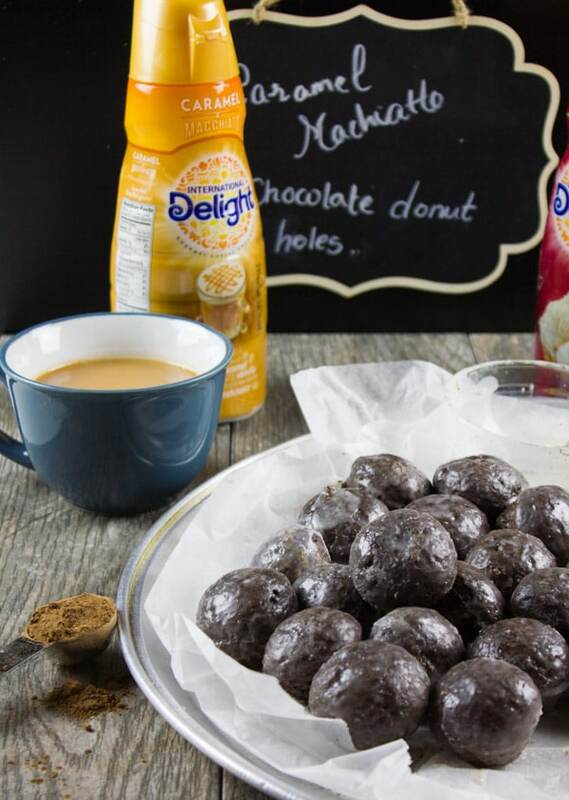 Give yourself twenty minutes to make these chocolate donut holes, pour a nice hot cup of coffee, sweeten it with your favorite flavor of International Delight® and have yourself a real treat!! better off, invite some friends over and share the love! 🙂 Enjoy 🙂 P.S–here’s a great resource for inspiration and awesome recipes using International Delight®! Preheat the oven to 350 degrees. 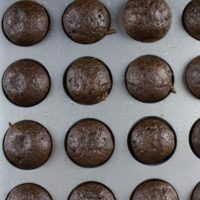 Lightly grease a mini muffin pan (or line it with baking paper) and set aside. Start off in a bowl add all the dry ingredients and mix well. In a larger bowl add all the wet ingredients and mix well. 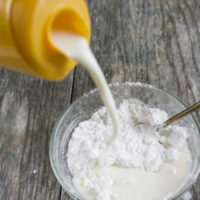 Finally, pour the dry ingredients over the wet ingredients and mix them well. 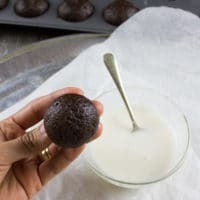 Spoon the batter into the mini muffin pan and bake for 10-12 minutes at most. Most of all, the donuts are ready when they feel springy to the touch, or if you use a toothpick inserted in the centre--it should come out clean. 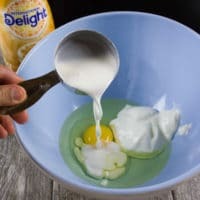 In the meantime make the glaze by mixing ingredients together in a bowl. 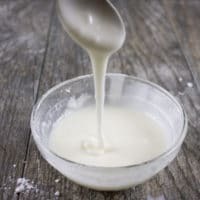 Consequently you can adjust the thickness of your glaze by adding more confectioner sugar for a thicker glaze, or more creamer for a runnier glaze. 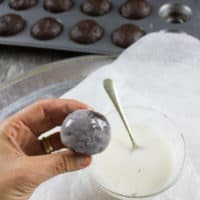 Once the donuts are cool enough to handle, remove them from the muffin pan and dip them one at a time (either dip only the top of the donut or the entire donut) into the glaze and set them to dry on a parchment paper.